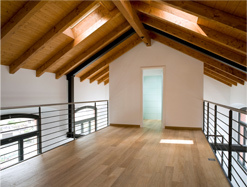 Interloft are loft conversion specialists in Yorkshire. With over 15 years’ experience and a professional, reliable team, we can provide a wide variety of attic, part loft and dormer conversions across Yorkshire to suit almost any requirement. So Why Choose a Loft Conversion? Loft conversions convert your limited attic space into a new room to suit your lifestyle, be it a bedroom, bathroom, office, games room – the options are endless. An attic conversion is much more cost effective than a conservatory or extension and in most cases requires no planning permission. Additionally, loft conversions can significantly increase the value of your home by expanding the living space of your property – so in many cases loft conversions in effect pay for themselves! At Interloft we pride ourselves on offering the highest standards of service. All our staff are trained in-house and we never use sub-contractors, so you can be assured that you’re getting the professionalism and standards you expect and deserve. Our dedicated team use CAD design and drawings to ensure the attic conversion meets your bespoke specifications. We complete all loft conversion projects within 6-8 weeks and work with you every step of the way so you can be sure the final result will be exactly as you imagine. With a ten year guarantee on all attic conversions, Interloft really is the only company you need for loft conversions in Yorkshire! For a more information or a FREE QUOTE for a loft conversion please call 0800 999 4034.